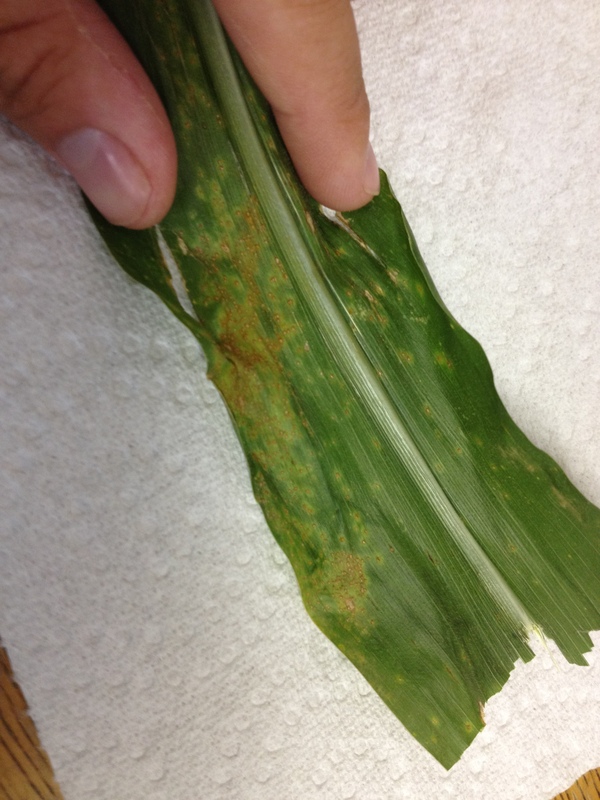 Southern corn rust is the most important disease affecting corn in Georgia. Southern corn rust was found today in a very small amount in Seminole County on corn at the R2/blister stage (older than most corn in the state). The disease cab spread rapidly in storms and also with irrigation. Conditions last week were favorable for development and spread. I have recommended that growers hold off spraying until we find rust. Now that we have found it, I have enough respect for the disease to say that growers in the southwestern part of the state whose corn has reached (or is about to reach) tassel growth stage an application of fungicide to protect the crop. Growers in other areas removed from extreme SW Georgia should consider to monitor the spread of the disease. Some may want to make fungicide application either as a 1) Safeguard or because 2) they are already making a trip across the field to spray something else. If northern corn leaf blight is not a problem in a field, then growers have many fungicide options, to include tebuconazole to manage rust. For longer protective windows or where NCLB is also a problem, growers should apply strobilurin or fungicides that include some combination of strobilurins, triazoles, and SDHI active ingredients. As of today, Asian soybean rust has now been found in small amounts on KUDZU in the following counties: Miller, Baker, Grady. We can assume that soybean rust is present in low amounts throughout SW Georgia.